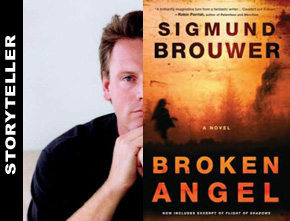 Sigmund Brouwer, who has written more than 40 books, wants to promote literacy. To that end, he visits schools all over North America. The Alberta-based author is known for adult fare, such as Broken Angel, Flight of Shadows, Fuse of Armageddon and (with Hank Hanegraaff) The Last Disciple; and children’s books such as The Winds of Light and the Accidental Detective series. Brouwer recently spent a week in B.C.’s Okanagan region, motivating kids to read and write — utilizing humour and his own life experiences. The four city tour became a reality after parents belonging to Christian Home Educators of Kamloops (CHEK) approached Christine Loewen, Learning Camps Assistant for Heritage Christian Online School (HCOS), with a proposal to bring Sigmund Brouwer to Kamloops. CHEK parents wanted to give their children the opportunity to participate in a writing workshop presented by the popular author, but needed help with funding. HCOS agreed, and included their students in Penticton, Kelowna and Vernon. The group also brought Kamloops Christian School (KCS) into the mix. KCS hosted an evening with Brouwer for parents and educators. He shared effective ways to inspire children to read and write. A true storyteller, Brouwer entertained the group with humorous tales, skillfully woven with tools to help children embrace reading and writing. “Writing isn’t an intellectual process. Writing is an emotional process. I believe that we are first and foremost emotional creatures and we react to people emotionally.” With that said, Brouwer challenged the adults to react to children’s work with emotion and excitement, rather than the academic response of ‘that’s good’. He pointed out the importance of writing without too much attention to rules, but rather letting children explore through writing a story. The following morning, KCS elementary students listened, learned and laughed with Brouwer before he headed off to speak with the home school students. Janaea’s mother, Christine, cited Brouwer as a fine Christian speaker. “I appreciate his Christian perspective. He was very funny and kept the kids engaged all day” — a difficult task, considering the group consisted of students from grades 3 through 10. Brouwer relates well to children struggling with literacy, because he almost didn’t pass his own high school English class. He embraces the opportunities to inspire children to read. He admitted that writing is difficult, but suggested that we all improve with practice. Brouwer uses the internet as one example of the benefits of good writing skills. Many employers now require resumes and communication sent via email. Without the face-to-face meeting of old, applicants with weak writing abilities are at a significant disadvantage. Conversely, children who are taught to read and write in a positive environment will likely fare better with their electronic job applications.